The immediate past President, ANAN, Hajia Maryam Ladi Ibrahim, addressing delegates. In a bid to advance the study of Accountancy and to develop good accounting practice, the Association of National Accountants of Nigeria (ANAN) has unfolded its plans to build a research centre at the Federal University of Agriculture, Abeokuta. The President of ANAN, Alhaji Sakiru Olabode, made this known during a parley with Management of the University when delegates from ANAN paid a courtesy call on the Vice-Chancellor, Professor Olusola Oyewole. According to the President, the focus of the research centre would be to help in the development of small and medium scale enterprises and would be called, “Linking Accounting with Business of Developing Economies”. 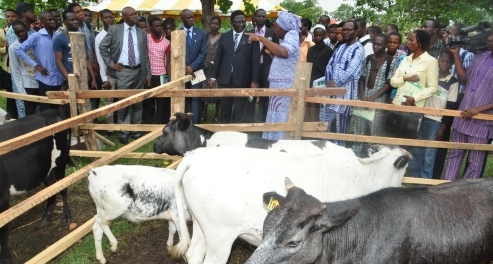 Chief Olabode stated that considering the peculiarity of the University, whose flagship programme is agriculture, the centre would train people on good record keeping, in agriculture, noting that aside building the Centre, ANAN is interested in its Management and would give annual grants to support the running of the centre. He stated that the Association already had five research centres spread across the country, namely: Governmental and Financial Accounting Research Centre, at the Nasarawa University, Keffi; the Leadership Accounting Development Investigation Centre, Ladi; Kogi State University, Ayangba; Centre for Accounting Postgraduate Research, University of Jos; and Centre for Financial and Accounting Research at the Nigerian College of Accountancy. 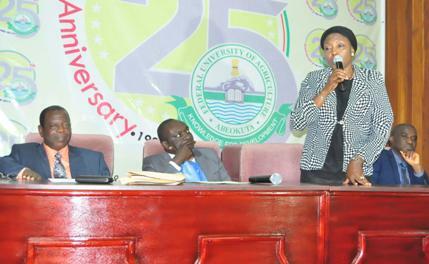 The ANAN President, who expressed satisfaction that the era of bitterness and misunderstanding between the two accounting institutes in the country; Institute of Chartered Accounts of Nigeria (ICAN) and ANAN was over, commended the Management of the University for not discriminating between their members, while adding that ANAN operates using international standards. Chief Olabode encouraged Management to report any of its members, found wanting or is involved in any financial misdemeanor to the body, stating that ANAN has a disciplinary panel that would sanction the erring staff. The Vice-Chancellor, Prof. Olusola Oyewole, represented by the DVC (D) Prof. Felix Salako, with the President of ANAN, Alhaji Sakiru Olabode (Right) and others during the visit. Corroborating the President, the immediate past President, ANAN, Hajia Maryam Ladi Ibrahim warned members against financial indiscipline, stating that the Association was committed to keeping the socio-economic activities of the country moving in the right direction. She encouraged accounting members of staff to register with the Association, stressing that “We expect that every professional body are members of either of the bodies and must be registered with the Financial Reporting Council of Nigeria (FRCN), because you would not be able to accept their accounts except you are registered with FRCN”. Responding, the Vice-Chancellor, who was represented by the Deputy Vice-Chancellor (Development), Professor Felix Salako thanked the Association for choosing FUNAAB to build its research centre, stating that the centre would contribute to the development of the University’s new College of Management Science which offers programmes in Accounting, Economics, Business Management and Entrepreneurial Studies. 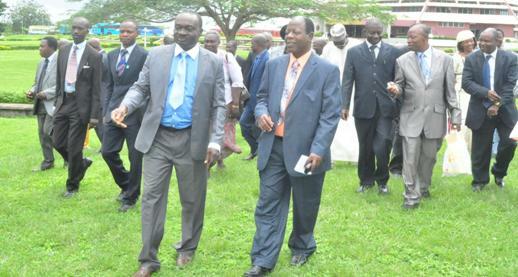 Professor Oyewole assured the ANAN delegates that their request would be presented to the University’s Governing Council, adding that FUNAAB was proud of its staff. In his remarks, the University Bursar, Mr. Moses Ilesanmi, confirmed that the University does not discriminate among its staff members but rather evaluates them based on their performance and competence.